It's 1942 and Maggie is back in London after her trip with the Prime Minister to meet with President Roosevelt. She's working in an SOE (Special Operations Executive) office on Baker Street, and is understandably surprised one night when she learns that her friends have fixed up the house she inherited from a grandmother she didn't even know she had. When her old collage friend shows up after her home blows up, Maggie is glad for the company - it's a house that holds some bad memories for Maggie. On her job, Maggie is dealing with a misogynist boss who couldn't be more dismissive of her constant appeals for equal pay for the young women who are trained operatives and being sent into enemy territory or benefits for their families should anything happen to them. When it appears that an agent in France may be compromised, Maggie can't even get him understand her seriousness of the situation. Heck, she can't even get him to call her by her actual name. Apparently, the only use "Meggie" has is to fetch him his cuppa. And, just as Londoners begin enjoying a bit of a break from the nightly bombing by the German Luftwaffe, under cover of the intense blackout conditions a mad man, dubbed the Blackout Beast by the newspapers, emerges who begins imitating the murders of Jack the Ripper and targeting the young women who are working for the SOE. These are women in London for a short time before beings sent overseas and their unfamiliarity with their surroundings and having no friends or family nearby makes them particularly vulnerable. Readers will certainly be surprised when they discover how this new Jack is able to overcome these trained agents so easily. Because all the victims are SOE agents, Maggie gets sent to Scotland Yard to work with Detective Chief Inspector James Durgin, who also seems a bit of a misogynist at first and not at all happy about working with a female MI-5 operative. Working together, Maggie begins to see a mathematical pattern emerging as they investigate the murders, while DCI Durgin prefers to rely on his gut feeling. As the two get closer to solving the crime, they begin to appreciate each others methods a little bit more...and maybe even each other. If you have been reading Maggie Hope mysteries as I have been, you know that by now it is a little like visiting an old friend. We know all about her friends, her boyfriends, her family history. And yet the novels never feel stale. In The Queen's Accomplice, Maggie's college friend Sarah, a dancer by profession, and her old boyfriend Hugh Thompson, are about to be sent to France as SOE operatives, passing themselves off as a married couple. Her old boyfriend John Sterling is still in California, working for Disney creating wartime propaganda. Maggie believes her mother, Clara Hess, a German and a high level Nazi supporter, and whom she never knew until the war, is dead. And her newly discovered German half sister Elise Hess had been sent to Ravensbrück Concentration Camp, but Maggie is now excitedly expecting her in London. 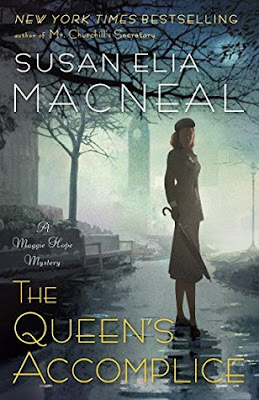 The Queen's Accomplice seemed like perfect book to read during Women's History Month, since MacNeal really highlights some of the difficulties women doing war work encountered back then. The parochial attitudes will no doubt resonate with some readers in today's new world. And I was very happy to see MacNeal's reference to Lion Feuchtwanger's 1925 novel Jud Süß which is a formidable counter to the horrible, anti-Semitic movie made by the Nazis. There is lots going on in her life, but Maggie Hope is a cozy mystery reader's delight.